China is one of the original places of bamboo plants. Its bamboo culture is rich and has a long-standing history; China has as many as 400 varieties of bamboos. In the huge amount of bamboo resources of China, dragon bamboo deserves the title of “the king of bamboos”. 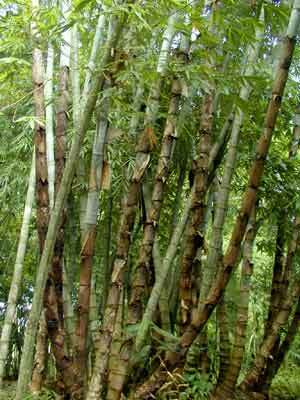 It is tall and upright; it can grow as tall as over 30 meters, and the diameter can reach more than 30 cm, and it is the thickest bamboo ever found in China. The Dai folks of Xishuangbanna call it “the largest bamboo”. Dragon bamboo is not huge in amounts and is mainly scattered in Lincang and Xishuangbanna. The daily lives of the Dai folks have close relation with the dragon bamboo, and even reaches the degree “it cannot do without it for even one day”. When they build their bamboo buildings, it is the best materials without saying; its upright trunk can be used as the drainage grooves; its thick barrel can be used as cans; its hard joints can be used to make bamboo basins, bamboo bowls, and bamboo meal boxes; the bamboo roots can be used to make craftworks; and its huge shoots are superb shoots among all bamboo shoots etc. The bamboo buildings of the Dai folks are unique; they are clean and tidy, they not only have national features, they also resemble the “flying phoenix” in the legends. For hundreds of years, they are always the prides of the Dai folks, and dragon bamboo has its contributions to all of these. There are also quite moving stories regarding the bamboo buildings of the Dai folks. The chief of the Dai folks and the great hero Payasangmudi designed and constructed two types of bamboo buildings for the Dai folks; but neither of the buildings were so successful. When he was mediating how to build the most idealistic buildings, the God of Dai folks, Payaying, changed into a phoenix and danced in the rain in front of the chief. When the phoenix spread its wings, it indicates that the ridge of the building should be like a “ ”(Chinese character that means a “man”); when the phoenix sink its head and drag its tails, it indicates that the two ends of the “ ”shaped framework should be tied together; and when the phoenix stands on the ground, it indicates that the building should have two layers. When the phoenix flied away, the smart Payasangmudi simulated the dancing of the phoenix in the rain and created the high-footed bamboo building, which could shelter people from the rains, and which could also protect people from the attacks of fierce animals; and the bamboo building is still in use today. Another story goes: in the period of three kingdoms(), Zhugeliang marched to the area of the Dai folks with his troops; when he saw the Dai folks had no housing, he took off his hat to let the Dai folks to construct buildings according to the shape of his hat; and the Dai folks did as they were told, thus they had their bamboo building until today.